I recently made a post about the Starz show Ash vs Evil Dead, which furthers the adventures of Ashley J. Williams, reluctant Deadite-fighter from the Evil Dead movies. In that post, I mentioned that the only movie necessary to enjoy the television show would be 1987’s Evil Dead II. A cabin in the woods. Nothing bad can happen there. Recordings of the professor’s transcription of the dangerous Necronomicon are played, bringing an evil force to the cabin. Ash is forced to kill his possessed girlfriend, but still can’t escape the cabin. The recap is very efficient in handling Evil Dead‘s information, in my opinion making the first movie not necessarily required watching to enjoy the sequel. 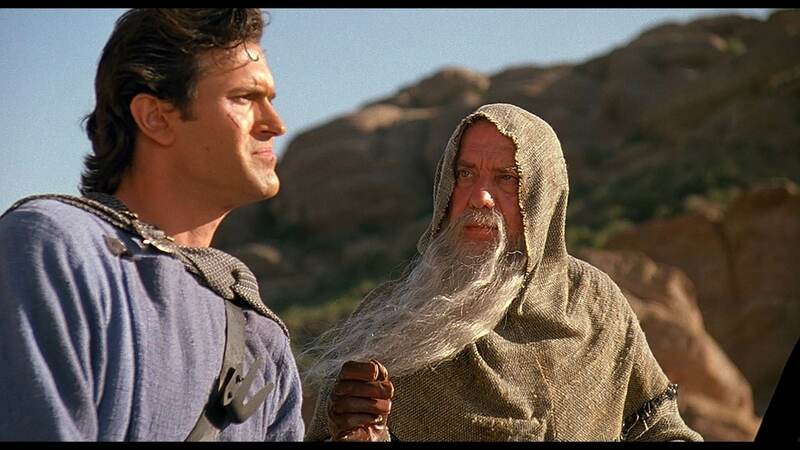 The television show itself has shown flashbacks and/or visual references to Evil Dead II, and has made no mention of the events of Army of Darkness, so until Ash starts telling Pablo and Kelly about the time he was nearly made a king in medieval England, I’m assuming Evil Dead III is not in the show’s canon. In some ways, ignoring Evil Dead and Evil Dead III sidesteps a continuity issue. For example, the Necronomicon gets destroyed in the first Evil Dead. The Book of the Dead: It’s Now Undead? I consider Evil Dead II a proper sequel to Evil Dead, with the first section of the sequel a “previously on” recap. It’s not a literal recap: in the first movie Ash and his girlfriend Linda are traveling with three other companions, who are omitted entirely in the second movie. 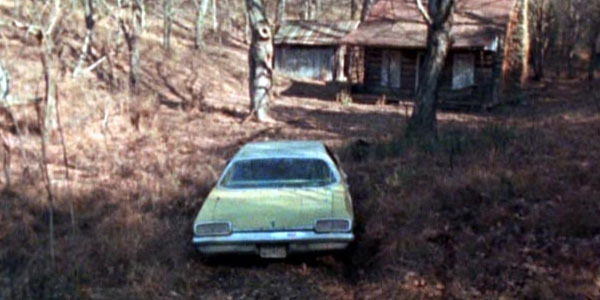 Because of that change, some people question the validity of the first act of Evil Dead II as a proper recap. And there are some people who apparently think that Ash is going back to the same cabin a second time with a different girlfriend coincidentally named Linda. And he has apparently forgotten about the whole demon-summoning recordings. The more reasonable argument is that Evil Dead II is a reboot, that there never were other kids on the trip to the woodsy cabin in this new continuity. That’s an interesting thought, since the event of the Necronomicon’s destruction in the first movie doesn’t have to happen. The Necronomicon is in the second movie, but only in the first section that could serve as a recap. Pages from the book of the dead are instrumental near the end of the movie, when Annie (the daughter of that professor who initially summoned the evil forces, you remember…) used them to force the primal evil into physical form, and then banished the evil (and Ash) centuries into the past. But those pages are brought to the cabin by Annie, and are equally relevant whether the Necronomicon was destroyed by Ash or not. In the television show, Ash has the intact Necronomicom in his possession, which is problematic if he destroyed it in Evil Dead. Where did this copy come from? Well, Ash could have brought the copy from the medieval time of Army of Darkness, when he returned to the future. So, the existence of the book therefore implies Army of Darkness is canon for the show. Unless Evil Dead is ignored. In which case things work out. My problem is: I can’t ignore Evil Dead. Even though Evil Dead II solidly covers the bases, there are scares and epic moments in the low budget original that I just don’t want to dismiss. So in my personal head-canon, the book gets destroyed. Look, no one expects the Evil Dead movies to make sense, it’s all good. Even I don’t care where the evil book Ash is carrying around in Ash vs Evil Dead has come from. I just like talking about continuity, because that’s one of those fun geek activities. 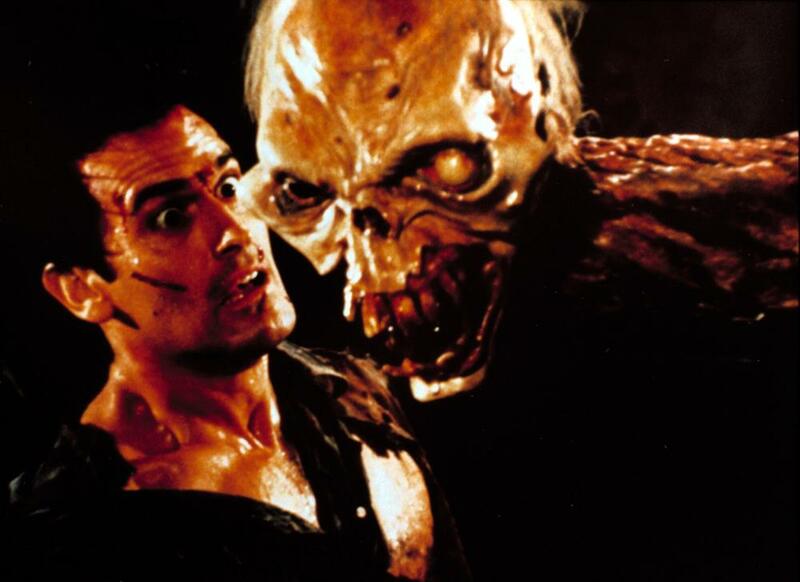 Or like how Evil Dead II is not only a smooth recap of Evil Dead, it’s also a reasonable recap of Army of Darkness. It’s a recap of its prequel and its sequel! Ash has been sent back in time. Ash kills it, and earns their praise. Basically, that’s pretty much what happens in Army of Darkness, just with a lot of shenanigans expanding those beats into a full movie. 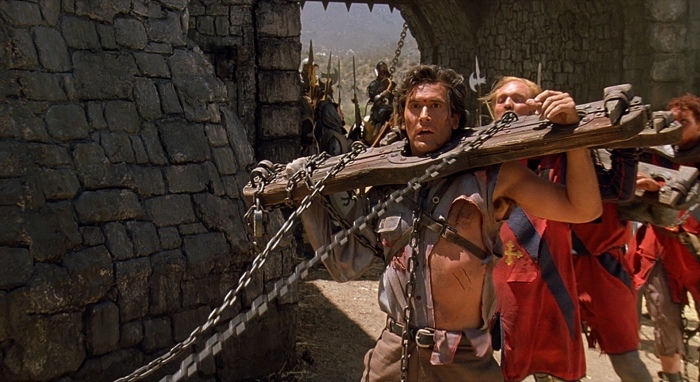 If we literally consider Army of Darkness as a continuation of Evil Dead II, it doesn’t work. Ash ends the second movie a hero in the eyes of these soldiers. Not groovy! Weren’t these guys praising me at the end of the last movie? But he starts Army of Darkness as their prisoner, being marched off to a gruesome fate. It’s easier to ignore the actual end of Evil Dead II and sync up at the point where Ash falls through the portal into the past. And fun! Army of Darkness is fun. It’s too fun to ignore even if it screws up the continuity, or that the television show might be ignoring the third film, since the show doesn’t seem to have the rights to anything from Evil Dead III. That’s all hurting my head. Lets take a step sideways a moment. To carry on the tradition, I’ve picked another fantasy property to associate with Evil Dead. This time up: the Lord of the Rings. 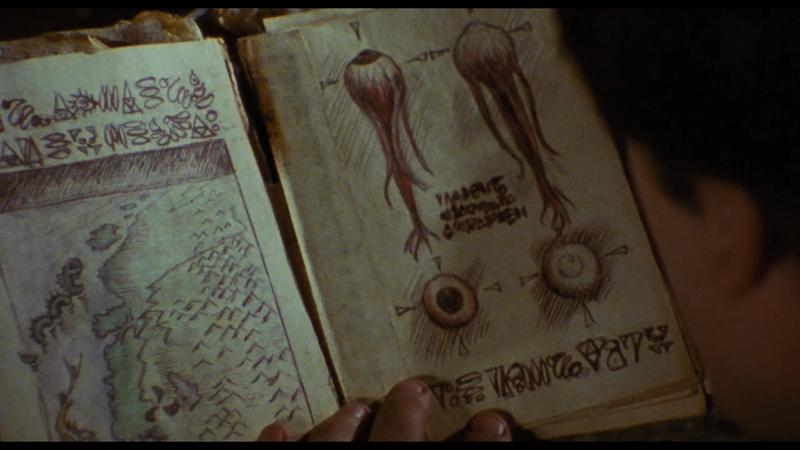 The Necronomicon in the Evil Dead universe represents the classic dangers of magic. It’s a portal to hell. It can summon monsters. It can also be used to wield great power. But it’s risky. Terribly risky to use. This is similar to Sauron’s ruling ring. 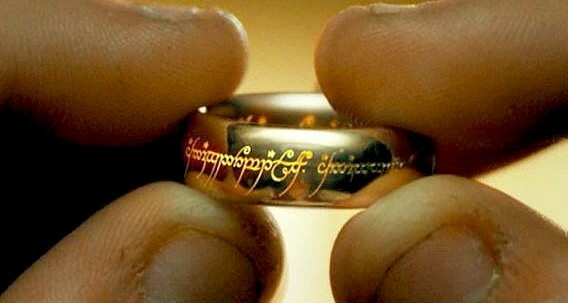 The One Ring is literally an instrument of evil, infused with Sauron’s malice. Wearing it acts like a corruption. (Hobbit’s just take a long time to corrupt, because they’re so set in their ways.) Wearing it connects the wearer to the world of wraiths and the dead. It also entertains me to think that Ash landed not in the past, but in Middle Earth, in some far off corner where he runs into one of the Istari who came with Gandalf, Radagast, and Saruman way back when. No need to argue with me, Tolkien scholars. I’m in the zone. Feel free to tell me how you resolve the differences in the overlap between the three movies. There are no wrong opinions. Images from Evil Dead, Evil Dead II, Army of Darkness, and Lord of the Rings. I make no claims to the images, but some claims to the text. So there. I’ve never really considered Evil dead 2 as a direct sequel despite the name. I’ve always considered it a reboot. This is because when I read about it in Fangoria Sam rami said that he didn’t think allot of people saw the original so he decided to retell it. Bruce also stated that he didn’t like the way ash was portrayed in the first movie so he was rewritten. I also really love evil dead 2 as one of my favorite all time movies, and I cannot ignore the established cannon that it presents with Ash going to the cabin alone with his girlfriend. However from a fan perspective the movies can be linked. The book of the dead is a book of portals. It’s entirely possible both movies can be accurate because once the time portal opened several different timelines could have branched off. I hear and agree with what you’re saying. I tend to keep Evil Dead 1 in my head-canon, since I am a fan of Ash trying to hold out for dawn, but at 6 am the clock goes back to midnight. Ash vs Evil Dead has embraced at least Cheryl having been with Ash at the cabin, so the first movie has gained some legitimacy over the years. Hey, I appreciate you reading my Evil Dead stuff from last year, and commenting. Thank you so much! Just pointing out that Ash does make a reference to Army of Darkness in Ash vs Evil Dead. He mentions to Pablo something about how he traveled to the past before. 2) I should thank you for reading my post, and responding, I appreciate it.